PORTLAND, Ore. -- Bird advocates tussled with the government Wednesday, claiming that the killing of thousands of native cormorants likely had little to no effect on the population of endangered salmon that return from the Pacific to spawn in the Columbia River Basin and did nothing to address the true reason for the endangered fish's decline: hydroelectric dams. The Audubon Society of Portland led an April 2015 lawsuit against the U.S. Army Corps of Engineers, U.S. Fish and Wildlife Service and U.S. Department of Agriculture Wildlife Services. Lawyers argued their cross-motions for summary judgment before U.S. District Judge Michael H. Simon on Wednesday. The dispute began with a biological opinion calling for the government to increase the population of adult salmon that return each year to the Columbia River and its tributaries to spawn. To comply with the opinion, the government could have chosen any danger facing salmon at any point in their lifecycle. The Corps decided to focus on the number of young salmon that make it out to sea, reasoning that if that population increased, the number of adults that make it back would rise as well. From there, the Corps narrowed the long list of possible dangers facing juvenile salmon to one: cormorants. East Sand Island, a 60-acre island in the fertile waters where the Columbia River empties into the Pacific Ocean, is home to the largest breeding colony of double-crested cormorants in North America. The sleek, blue-black birds are native to the area and protected under the Migratory Bird Act. They hunt by diving into the water to swim after small fish. In 2015, the government launched a program to kill about 11,000 double-crested cormorants over four years, reducing the population of the species' largest North American breeding colony by nearly two-thirds. But bird advocates say killing all those birds may have accomplished nothing. No one knows whether reducing the number of young fish eaten by cormorants, a natural predator that co-evolved alongside salmon, will actually affect the numbers of returning adults. For every 100 salmon that hatch in the river and go out to sea, between one and three will return to the spot where they were born to lay their eggs. Between those two points in the salmon lifecycle, there are dozens of lethal forces that can kill them. Even if all the young salmon in any given year survive their swim past East Sand Island in the mouth of the Columbia River, there is no way to know for sure whether the same number might end up eaten by other birds or swimming predators, chewed up in the turbines of a hydroelectric dam or dead from diseases that proliferate in warming waters. That idea is called compensatory mortality -- if you remove one predator or danger, what is the rate at which the same fish will be killed by something else? In other words, how many of the young fish that weren't eaten by cormorants will end up dead for another reason? No one knows the answer to that question, and the Audubon says that means the Corps' plan has no firm basis in science. Seen in that light, the government's focus on cormorants amounts to nothing more than a guess at what could bump up the numbers of adult spawning salmon, according to Dan Rohlf, lawyer for the Audubon and professor at Lewis & Clark Law School. "We still don't know the specific gaps that need to be closed to improve adult productivity," Rohlf said at Wednesday's hearing. "Because of the lack of information on compensatory mortality and the relationship between colony size and predation rates, that gap is unknown and could be quite small. There's nothing magic about controlling cormorant populations that will close those survival gaps." Stephen Finn with the Department of Justice defended the government's plan. "Nothing has been shown to be arbitrary or capricious about an agency addressing adult productivity through a specific moment in the lifecycle process," Finn told Judge Simon. "Compensatory mortality a known unknown," Judge Simon said. "We haven't talked about the unknown unknowns because we don't know about them." "Give us time, your honor," Finn said. 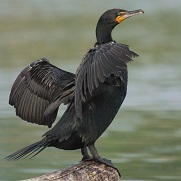 The Audubon said in its lawsuit that the government's focus on the cormorants had little to do with protecting salmon. Rather, it was a calculated move to divert attention from the major danger facing salmon: the more than 60 dams in the Columbia River Basin. More fish make it past the dams than ever before. But the Audubon says killing cormorants is a cheap and easy way for the Corps to appear to be solving a complex problem by scapegoating an innocent bird. The Audubon claims the government is well aware that the problems facing salmon are much larger than outwitting a natural predator. "More than two decades ago, a federal district court criticized federal agencies' efforts to restore salmon and steelhead populations in the Columbia River Basin, observing that federal dam operators had completed only 'relatively small steps, minor improvements and adjustments -- when the situation literally cries out for a major overhaul," the Audubon said in its April 2015 lawsuit. "Sadly, over the past 20 years federal dam operators have looked virtually everywhere but in the mirror in their search for culprits to blame for the decline of Columbia Basin salmon and steelhead. Without even considering an overhaul of dam operations to improve salmon survival, the U.S. Army Corps of Engineers has instead decided to kill thousands of native birds that have coexisted with salmon for millennia." Finn said saving salmon was more important than protecting cormorants, because the birds are not endangered. "Weighing harm between an endangered species versus a species that is managed weighs strongly in favor of the endangered species," Finn said. Rohlf said over the phone that the government is forcing the birds to bear responsibility for a salmon population that is in decline because of human changes to the environment, not because of a natural predator. The government "had two choices," Rohlf said. "Reduce cormorant population back to 2008 levels or get increased juvenile and adult salmon survival by some other change. And that change would be changing dam operations, which none of the federal agencies want to do. So the only reason to kill all these birds is to balance out faulty math." He added, "We're shooting thousands of birds to make their math balance. It has nothing to do with protecting salmon." For now, the arguments are largely academic. In May, one month after the government began its second year of shooting adult cormorants and oiled their nests, the entire colony of birds disappeared en masse from East Sand Island. The government says it doesn't know why the birds abandoned the island, but the Audubon says it warned the Corps in 2015 that its actions could have just such an effect. As of Aug. 3, about 24,000 birds had returned to the island. More than 8,000 were seen by government observers nesting with clutches of three or four eggs. The government halted its oiling and shooting in May, but said in a statement that it may begin again this year if the birds' numbers continue to increase. Judge Simon estimated that he would issue a ruling on the parties' cross-motions for summary judgment in 60 days.